One of my favorite things to give at Christmas is homemade bread. It’s a delicacy many don’t have the time or patience to make, and the smallest children to the oldest grandparent appreciate it. 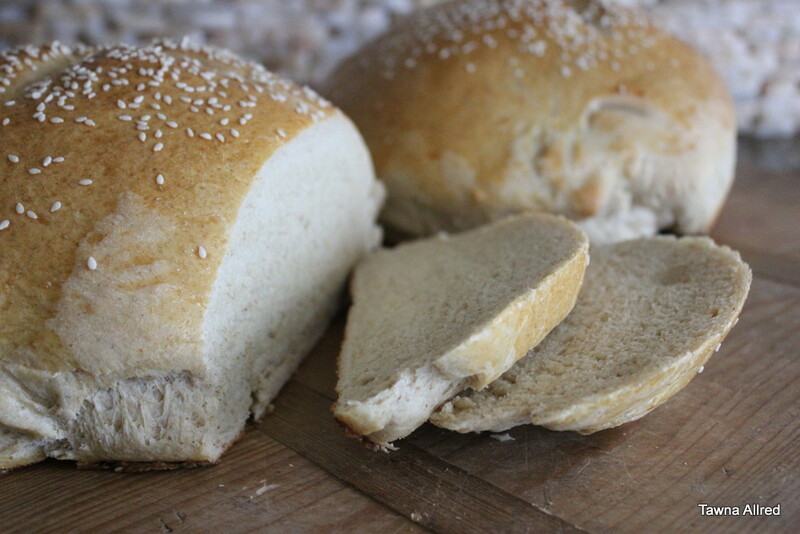 If making bread interests you, rustic breads are a great place to start. Shaping the loaves is taken out of the equation. All you have to do is squish the dough into a ball and cook it in a Dutch oven or on a cookie sheet. Here’s a delicious recipe that would make a lovely gift or go perfectly with your Christmas Eve dinner, which is fast approaching. In a Bosch mixing bowl, sprinkle yeast over water. Stir with the paddle once, then let sit until yeast begins to froth. Add the rest of the ingredients and beat for 10 minutes. Remove from pan. Place dough in a greased mixing bowl, and let rise, covered, until the dough has double (45 minutes to 1 hour). Punch the dough down and separate and form into two balls. Place on greased cookie sheet and cover the dough with the whisked egg. Sprinkle on the sesame seeds, and cook at 375 degrees until loaves are brown (30-45 minutes). Remove from the cookie sheet and cool on a rack.